Greencourt is open from mid February until end November. Please feel free to contact us at any time of the year, by phone or email. The standard rate of bed and breakfast ranges from £38.00 - £45.00 per person per night, and there are no added taxes. 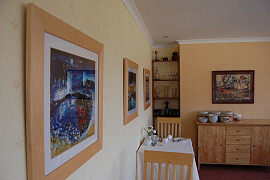 This includes a full Scottish breakfast and is based on two people sharing a double or twin room. The same nightly rate applies to our single room. Credit/card details or a modest non-refundable deposit of one night's accommodation are requested to confirm a booking following your enquiry. We regret we have to charge a supplement for the single occupancy of a double or twin room. The level of supplement is dependent on the time of year and duration of stay - at quieter times of year, it may be possible to waive the supplement altogether. Please contact us for more information. Check-in is any time from 3pm on the day of arrival. If you wish to arrive early or drop off luggage, please simply contact us so we can be sure to welcome you. Guests are requested to vacate their rooms by 10.30am on the day of departure. We are pleased to welcome children of all ages. Some of our rooms can accommodate an extra lightweight folding bed suitable for a child, or a travel cot. For the comfort of guests, we do not recommend more that one child being accommodated in our rooms. Please phone to discuss your requirements. Children under 5 are free, with reductions for children over 5 years. By prior arrangement, we are pleased to accommodate guests with special dietary or health requirements. For the comfort of all guests, Greencourt is an entirely smoke-free environment. Greencourt is not suitable for pets. A minimum of 48 hours notice is required (ie notifying us before 3pm two full days before the arrival date) to avoid cancellation charges. If a booking is cancelled with less than 48 hours notice, we will do our utmost to re-let the room(s). If, however, we are unsuccessful, and depending on the circumstances, the client who cancelled the booking will be liable for the cost of the reservation. In the event of non-arrival on the day of a booking, we have the right to charge the client for the whole of the first night's stay, and cancel the remainder of the booking. Again, we will endeavour to re-let the room(s) but cancellation charges may apply to any nights not re-let. We recommend taking out adequate holiday insurance cover before departure on holiday to protect against unforeseen circumstances and any cancellation charges.